Volkswagen had a better-than-expected first quarter. Operating profit rose 16 pct to 3.3 bln euros. Trading woes cannot explain the boardroom battle launched and lost by ex-Chairman Ferdinand Piech. If VW modernises its governance and keeps delivering cost cuts, shares may motor. A Volkswagen logo sign is seen inside the lobby of the U.S. headquarters building of Volkswagen Group of America in Herndon, Virginia, in this September 18, 2008 file picture. Volkswagen last week managed to price another auto ABS transaction at remarkably tight levels. But only 25 investors came into the deal. Cost-cutting and an improving European car market helped Volkswagen beat first-quarter profit forecasts. 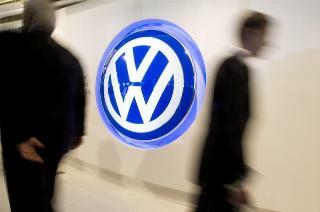 Operating profit increased 16.6 percent, Volkswagen said on Wednesday. At 3.33 billion euros, it was close to the top end of forecasts in a Reuters poll of analysts and well above the average estimate of 3.12 billion euros. VW shares rose 1.3 percent to 243.40 euros in morning trading, one of the biggest gains on Germany’s blue-chip DAX index. Four days after Chairman Ferdinand Piech quit in a showdown with VW’s Chief Executive Martin Winterkorn, the German group confirmed its outlook for the full year, expecting higher unit sales, revenue and an operating margin between 5.5 and 6.5 percent, after it reached 6.3 percent last year.